Like a number of old vans (and possibly some new ones!) 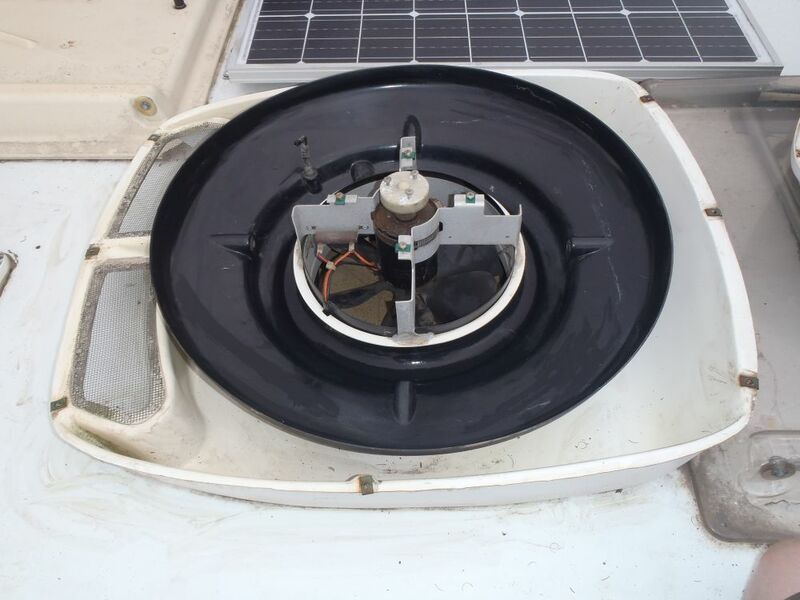 our Hymer B544 came to us with a Trav-L-Cool air conditioning system installed. These are ‘evaporative’ air conditioners so work differently to compressor driven air conditioners like you would find in cars and offices everywhere. Compressor based air conditioners work on exactly the same principle as a domestic fridge but are configured to remove heat from the air in your room (or car) and transfer that heat to the outside air, as opposed to transferring heat energy from the inside of the fridge to the outside of fridge. Evaporative air conditioners work by the principle that when water evaporates it removes heat from it’s surroundings, the same effect that causes your skin to feel cold if it is wet and you blow on it. Being an engineer I felt compelled to take the Trav-L-Cool apart to see how it works, and decided to give it a once-over while I was at it…………. 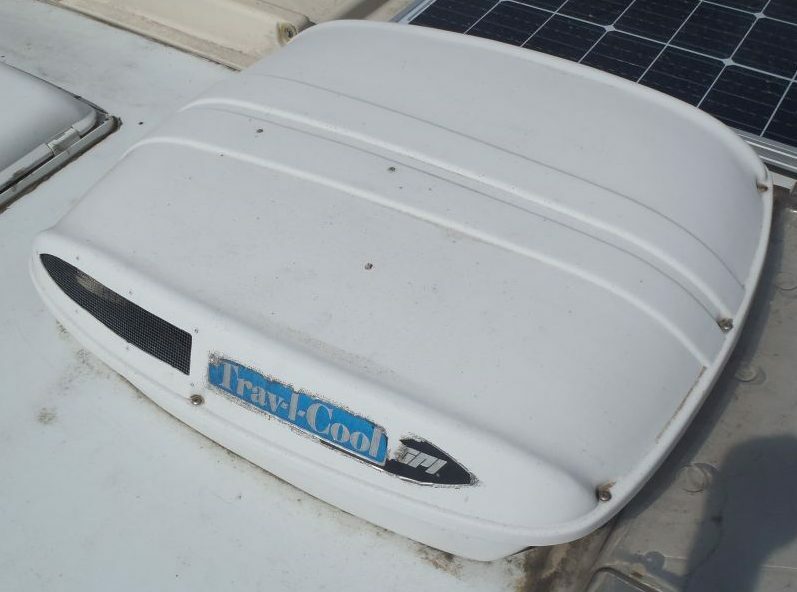 The Trav-L-Cool system consists of two main units, the roof mounted box and an internal tank/pump. 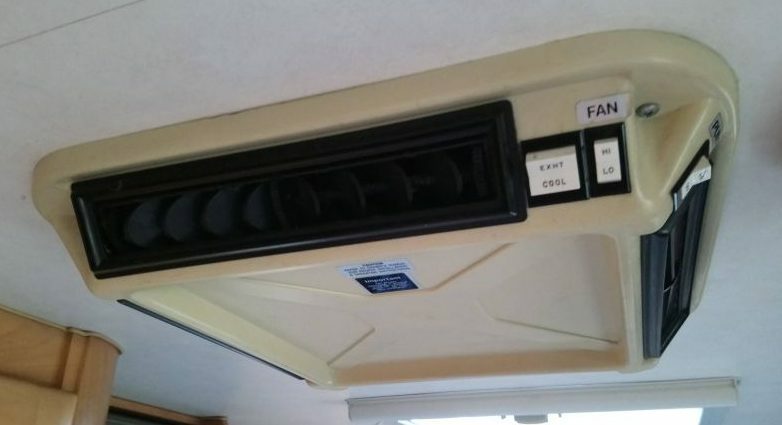 Water is pumped up to the roof unit where a fan draws air through a stream of water (to cool it), through a filter (which is also wet) and down into the van. 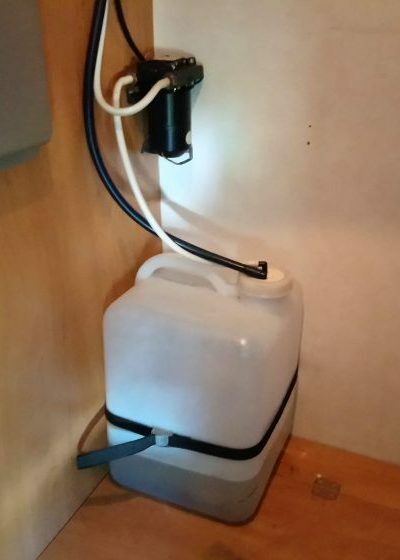 Excess water is returned to the tank. The system is not sophisticated but it is reasonably effective, with the main benefit over compressor based air conditioning being that it does not use much electrical power – the whole system runs off 12V so it can be used when mains electricity is not available. 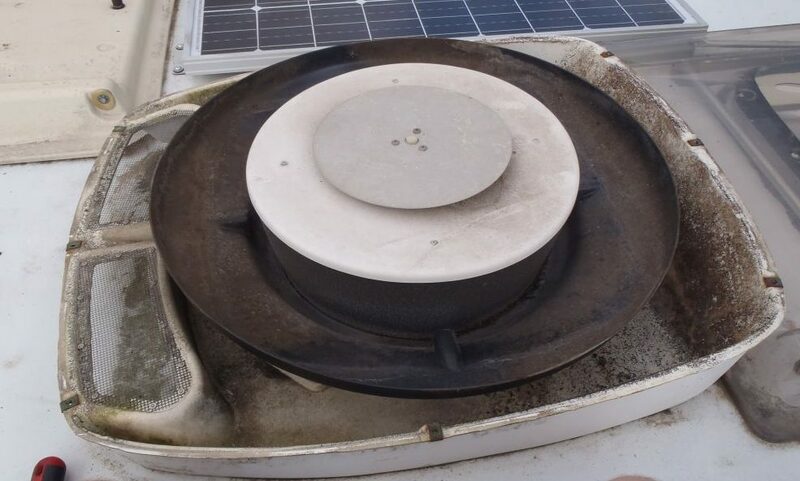 The system can also be used as a big extractor fan – the fan is reversed and the pump stopped so air is simply sucked up out of the van and discharged out of the roof unit. 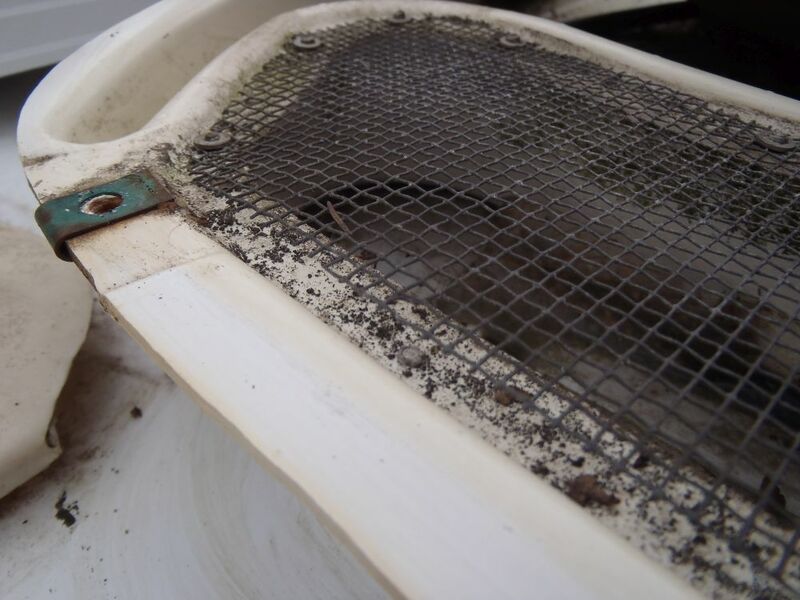 One thing to be aware of is that compressor based air conditioners remove moisture from the air as they operate, whereas the Trav-L-Cool system actually adds moisture to the air, so it is not as effective if it is very humid outside and you need to have a window opened slightly to allow air to circulate, otherwise you could end up with condensation forming on the inside of the van if you run it for many hours. 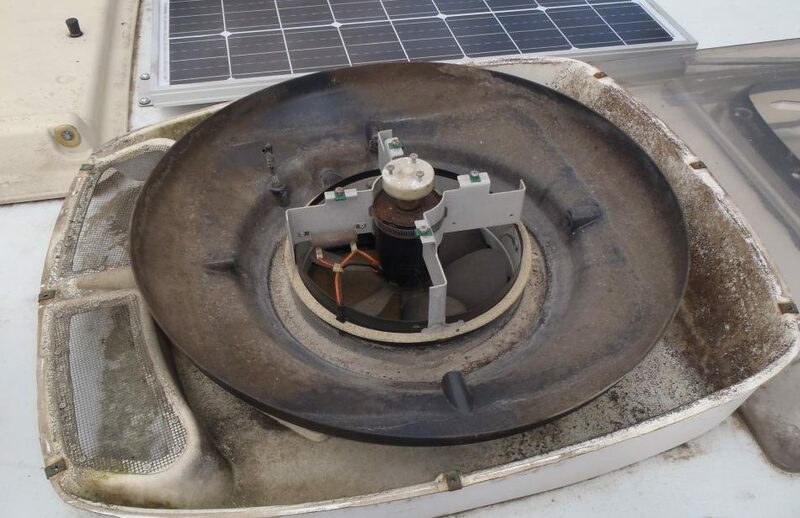 The metal disc you can see on the top of the filter is attached to the fan so spins when the unit is operated, the water that is pumped up from the tank is sprayed onto this disc which then flings it off in all directions! The filter is the big bit under the white disc, sat in a large black plastic bowl thingy. The result is that the air drawn through the filter passes through this waterfall of water, cooling it down. 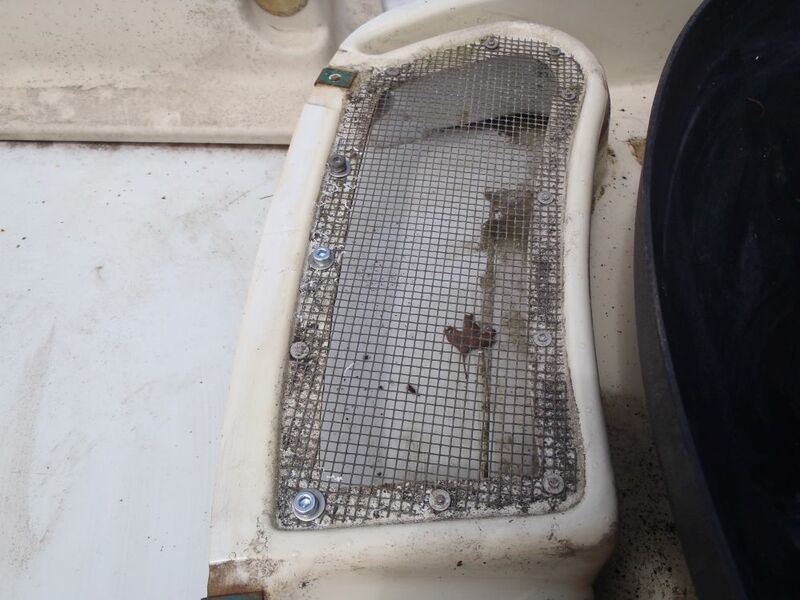 The filter also absorbs water from the black plastic bowl so it is kept constantly wet while the unit is working. After a few years of use the filter will be full of junk I took it out to clean it. To do this simply remove the three screws holding the metal disc in place and put the disc to one side. You can then remove the screws from the white plastic disc on top of the filter and lift the whole filter assembly out. I cleaned the filter by blowing the dust out with compressed air and then thoroughly rinsing the filter in clean water. After that it’s just a case or reassembling everything in the reverse order and the unit is ready for another few years of good service! 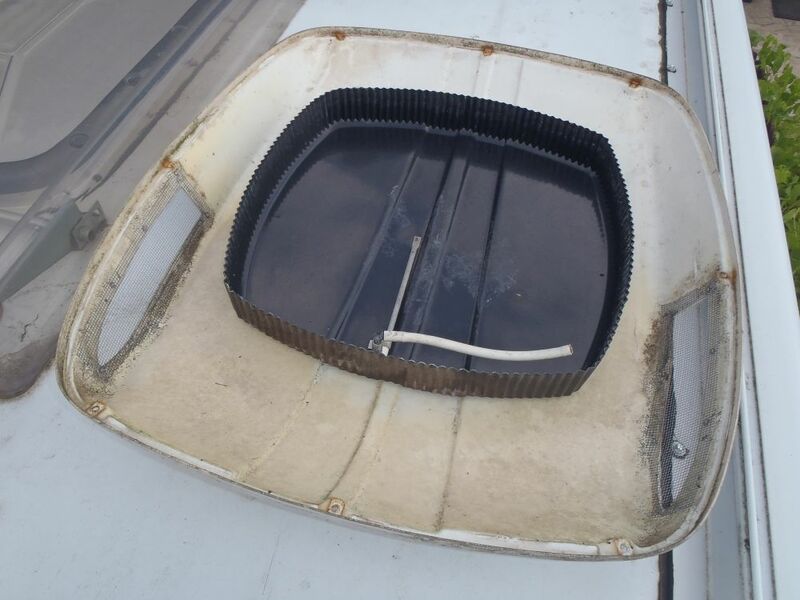 All of this is very easy to do with a few simple hand tools and an hour or so of time, so if you have one of these on an older van it is probably well worth the time to give it a clean out…….